We have been manufacturing kitchen cabinets for over 35 years. Our skilled team of employees ensure your kitchen is built to a superior standard with uncompromising attention to detail for a quality finish. 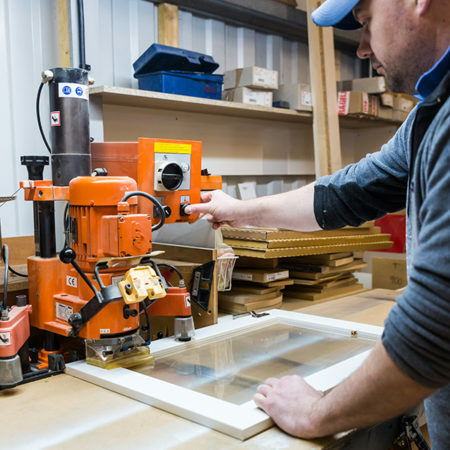 Thanks to our extensive experience in the industry, not only can we manufacture cabinets in any style and finish, we can also produce them to suit custom sizes and shapes. And what’s more, we build and install your kitchen to a standard you will love. Plus, as we manufacture our kitchens inhouse, we have complete control at this key stage allowing us to ensure that only the finest materials are used and your kitchen is built to the highest standard. Call us on 01383 739264 or pop into our Dunfermline showroom to discuss your ideas and requirements. Or alternatively please email sales@kitchenchoice.net. Simply come along to our showroom or contact our sales team to discuss your kitchen requirements. We will then arrange a site survey to get measurements and discuss the kitchen in more detail. We will then design and plan your kitchen using our years of experience to meet your needs. Our inhouse team of Kitchen Choice fitters will then carry out the installation of your dream kitchen. We pride ourself in customer service so we ensure you are happy we provide a great aftercare service.